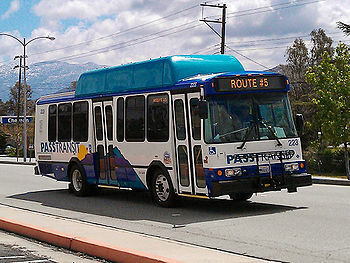 Pass Transit provides local bus service in the San Gorgonio Pass area, serving cities such as Beaumont and Banning in Riverside County. Regional connection is available to San Bernardino and (via Riverside Transit Agency) Downtown Riverside. One way fare from Beaumont/Banning to Calimesa is $2.50 adult, $2.00 senior/disabled. Fare to Cabazon is $1.40 adult. 25-cent fare upgrade is required when boarding with passes. Fare on the Commuter route is $3.00 one way for adults and $2.00 for youth, seniors, and disabled.